As appeared in Dealstreetasia by Bhawna Gupta. SaaS-based gift card solution provider Qwikcilver, a Bangalore-based company backed by VC investors like Accel India and Helion Partners, is foraying into Southeast Asia market (SEA). “We are bullish on SEA market and has started with Singapore 2-3 months back as our base. We are also expanding across the regions like Indonesia, Thailand, Philippines and other parts of SE Asia,” Sadiq Ahamed, chief strategy officer at Qwikcilver told DEALSTREETASIA. In Singapore, Qwikcilver has partnered with NETS, a payments company, to enable digital gift cards in malls and retailers across the country. It is also working with 99SME to enable gift cards for SMEs, and with Lazada for the gift cards to be sold on its site. “NETS being a dominant player in Singapore, it helps us to reach all the retailers and malls in a single shot. In this market there are only paper based vouchers. There is immense opportunity to digitize gift cards here. It’s also a large and worthy market hence, we are expanding here,” Ahamed said. Founded in 2008 by Kumar Sudarsan and Pratap TP, Qwikcilver was primarily started as a processor and is a SaaS-based prepaid card solution provider. The company is also engaged in the business of distributing gift cards to corporate and individuals through Woohoo.in, a firm which was launched in 2015. “Early this year, we launched operations in Middle East, and after starting in Singapore, the company will focus on Indonesia and Malaysia,” said Ahamed. The company has offices in Dubai, Singapore and Bangalore. “Middle East has turned out to be really good. It has been contributing a few percentage to the revenue of Qwikcilver. We also have signed up with 40-50 brands in Middle East including Sharaf DG, Al Futtaim group, Novo Cinemas, Emke Group and many more,” he added. So far, Qwikcilver has deployed its cloud technology platform across UAE, KSA, Kuwait, Bahrain, Qatar, Oman and Egypt. Apart from Accel and Helion, Qwikcilver is backed by investors like Amazon and Sistema Fund. Last year in July, the company had raised $10 million led by Sistema Asia Fund, the proprietary fund of Russian conglomerate Sistema. In the round, existing investors like Amazon Asia-Pacific, Accel India and Helion Venture Partners also participated. Prior to that in 2015, it had raised $10 million from Amazon and others. Ahamed further said that the company did not have any ‘requirement for fresh funding currently as it was already profitable’. “Right now, our focus is market expansion, whatever capital we have currently is what we are utilizing now,” he said. “Qwikcilver is unique in India, Middle East and South East Asia. There is not a single player who provides end-to-end management of gift cards for brands. We have a 90 per cent share of the gift card market in India. The gift card market in the areas – Middle East and South East Asia – that we have penetrated is not fully evolved in fact we are building the market in Singapore and rest of South East Asia ground up. We are the dominant player right now,” he claimed. Globally, Qwikcilver powers approximately 1.5 billion GMV worth of gift cards currently. Overall, around 100 million gift cards has been issued in the last three years and the company is expecting contribution of 20-25 per cent from South East Asia to its revenue in the next financial year. As appeared in TheWeek by Karthik Ravindranath. The adoption of digital wallets is at an all-time high. While these apps allow seamless transactions, there is often dead money in one wallet or the other. If you are running short of money in the wallet that you want to use, you will have to refill it while money in other wallets remain unused. Woohoo, an online gift card app by Qwikcilver allows you to aggregate your balances from various virtual wallets. You can buy gift cards from more than 100 brands. The gift cards can be stored on the app and it can be sent instantly using WhatsApp,email and SMS. A useful feature in Woohoo is the option to sell unused gift cards. So you can buy cards safe in the knowledge that your money would not be wasted. Once your card is sold, your bank account is credited directly. The app also allows you to customise the digital gift card with unique templates, selfies, voice messages, stickers and designs. Other benefits include discounted gift cards and partial redemption. The new features in the app include sending a group gift—you can invite friends and family to pool money—and pay using Woohoo balance, the app’s own wallet.The interface is easy to use. You can register with your mobile number and log in within seconds. The app has eight primary tabs on the home screen—discounted cards, send group gift, sell gift cards, buy gift cards, redeem Woohoo, manage gift cards, send free greetings and load card. Other settings can be accessed through the menu on the top left, and notifications are shown on the top right bell icon. However, the app is not without limitations. After registering, I got no guidance to set up my account or add payment options. These had to be found from the above mentioned menu. Dinamani is one of the leading Tamil daily newspapers, owned by The New Indian Express Group featured Woohoo. The article talks about the convenience of digital gifting and highlights the features of Woohoo. The article further puts the spotlight of Woohoo being present in 400 cities across 5,000 points of sales and its partnership with 150 brands across categories, providing customers a wide array of gifting options. And also highlights the ease in the use of Woohoo in android smartphones and calls it a boon specially during the festive season. As appeared in newindianexpress by Anna Binoy. There is some celebration every other day – festivals, birthdays, office parties and the list goes on. Last week was Onam and Pooja is right around the corner. Not surprisingly, there are a number of gift choices for loved ones too. But, despite the overwhelming availability, the old dilemma exists: What should I gift a person? In one of their research surveys, Qwikcilver had discovered that most gift purchases happen only three days before the event. Foreseeing this, Qwikcilver, powering 90 per cent of the gift cards in the country, has developed a superstore for gift cards called Woohoo. 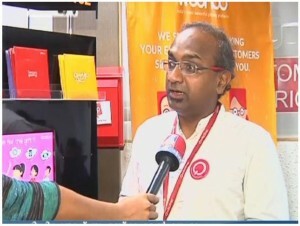 “Through this innovation, the person receiving the card has the freedom of choice,” said co-founder Pratap T P.
Customised gifting Through Woohoo, which functions as a mobile application and a website, one can purchase gift cards to as many as 150 brands that have partnered with the company. It was launched in 2015 and provides options for planned and customised value gifting. The app securely stores the gift cards and gives regular reminders regarding the expiry. In the latest group gifting feature, released a month ago, people can pool in the amount and gift the card to the recipient. This eliminates the hassle of coordinating and collecting individual amounts. In addition, it has a secondary market trading platform where one can buy and sell gift cards. “This is the first and only platform in the country that provides such an option,” said Pratap. Taking on Malayalees on social media Targeting the Malayali audience for Onam, the developers of Woohoo did a social media campaign on all the popular platforms. “The campaign was a humourous take on gifting, endorsing the celebrities in the Malayalam movie industry,” said Pratap. “We were trying to make a presence on social media,” he added Gifting culture Like the greeting card industry, which helped develop the birthday and anniversary culture in the country, Woohoo’s creators also expected to enhance the gifting culture among people. “It is instant gratification. But at the end of the day, we are just trying to improve human engagements through Woohoo,” said Pratap.